It is hard to beat a good fire. 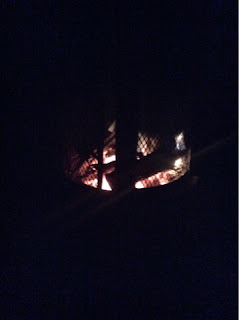 It is even harder to beat a good fire, good company and a guitar. So on the night of the first frost warning of September, it was some nice to sit around a cozy fire as my my good buddy Bill strummed and belted out some great tunes. I love to sing-along, never had the confidence to go solo, tap my feet and get right into with a bunch of friends doing the same. It is good for the soul. Did you know that group singing has been scientifically proven to lower stress, relieve anxiety, and elevate endorphins? Speaking of souls, did you happen to catch the CBC radio's Tapestry on Sunday afternoon. I really enjoyed the host, Mary Hynes, discussion with Katharine Hayhoe, an atmospheric scientist and a prominent figure in the study of climate change. She is also an evangelical Christian who married a fellow scientist who is a preacher. Her biggest task Is trying convince her fellow Evangelical Christians that global warming is real! A fascinating exchange of ideas, compromise and faith. But before I do, what are your favourite, out by the fire, songs? I'll make a Song Book and send you a PDF!